Don't these take you back? Blossom cookies, but I had never heard that before, and in fact, skimmed over the recipe several times before I looked at it. When I did look at it, I actually preferred an older recipe I had for these cookies, which came from my second cousin. This recipe below is super reliable, and tastes just how I want these cookies to taste. The Test Kitchen recipe is similar, but blends a cup of peanuts with the flour before adding it to the cookies–I don’t need that many peanuts for my taste. The suggestion of the Test Kitchen that I did like, though, is to put the Hershey Kiss on the cookie 1-2 minutes before they have finished baking. 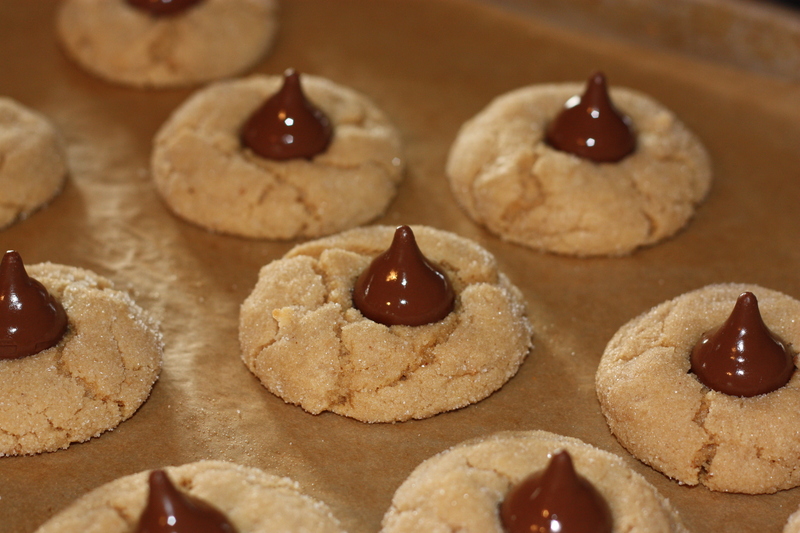 When the cookies cool, the interior of the kisses stay soft, which is a nice touch, and they have a nice sheen. This recipe yields about 24-28 cookies. Preheat oven to 375. Get out a cookie sheet, but there’s no need to grease it. In a small bowl, whisk flour, soda and salt. In another bowl, cream butter, then add peanut butter and beat until combined (1 minute). Add sugars and cream for 2-3 minutes. Then add egg and vanilla and mix another 30 seconds, until combined. Add the dry ingredients and mix until the flour has been absorbed, making sure to scrape the bottom of the bowl.